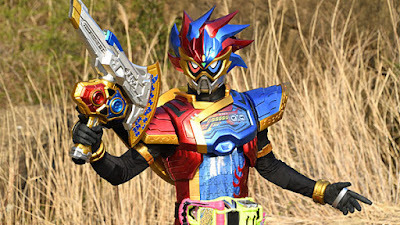 Today, we will learn about Emu's secret and how Pallad's a part of it. But before that, let's welcome Kamen Rider Para-DX Perfect Knockout Gamer Level 99! Kamen Rider EX-Aid episode 29 clips now online brought to you by Filip "Man from Japan" Judar! Oh man. That first video. Bodies are every where! Gotta feel a little bad for Hiiro, though. He finally gets to be Level 50 again, and he gets easily bested. This series has no brakes, I swear. And is Poppy going to be responsible for bringing back God himself? Exciting! Maximum Gamer LV 99 GOT DEFEATED???!!! Well, I guess it's time for Hyper Muteki Gamer!! !